We’ve ranted before about the effect of negative feedback. In the last few days we’ve seen some perfect examples of undeserved negative feedback affecting our Amazon seller rating substantially. Here is an example of someone giving us the feedback that should have been left for another purchase. In this next example, the customer was confused and thought 1 was the best possible feedback. Thankfully, they retracted the feedback when we brought this to their attention. These two reviews dropped us from 100% positive feedback for the last 30 days to 87%. With the eBay feedback system, I expect that about the same percentage of happy customers leave positive feedback as unhappy ones leave negative feedback. So, if I see a 92% feedback rating, I assume that there are a heck of a lot of unhappy customers and I tend to avoid sellers with ratings like that. Even a 98% rating can indicate a history of issues with buyers. But with Amazon.com, probably 10 or 100 times fewer satisfied customers will leave feedback than unhappy ones. Let’s make some assumptions and see what a real feedback score would be like if everyone left a review reflecting their experience. For example, let’s assume that 1/2 of all customers with a bad experience leave a negative review. We had 14 neutral or negative reviews in the last year, out of 3768 purchases. 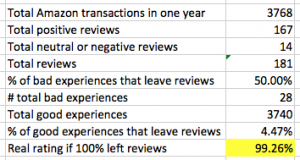 That assumption gives is 28 bad experiences out of almost 4,000 customers, or a real feedback rating of 99.26% (compared to our 92% rating as shown above). Put another way, you would have a one in 135 chance of having a bad experience. But that’s not the end of the story. Almost no-one that leaves us negative feedback contacted us first to see if we could resolve their issue. We are very helpful (if we do say so ourselves) and are always willing to solve a problem that is our fault, and usually solve issues that aren’t our fault as well. That means, with us, you have almost no chance of having a bad experience. I’ll bet a lot of other Amazon merchants are also very willing to work with their customers and have similar frustrations with the Amazon feedback system. That reminds me, I am way behind on leaving feedback on my eBay purchases. I’d better get to it. I couldn’t help but add a couple of recent feedback ratings we got on Amazon.com. That last one just kills me. It makes you wonder, exactly what does it take to get 5 stars in this day and age? Arrived promptly, was as described, was well packaged, was hand delivered by the seller, at no cost, very satisfied.